A visit from the Westboro Baptist Church. Plus, old folks rock the vote. Army veteran Mike Ehredt has been running since May 1 to honor fallen soldiers. It’s a surefire blueprint for media publicity. Swing through a city, throw out some incendiary rhetoric, pepper a few area colleges with hit-and-run half-hour picketing sessions and reap the massive exposure that comes from the outrage and much larger counter-protests. On Oct. 21, the Westboro Baptist Church — the chaps with the unique theological belief that God punishes America because He hates gays and Jews, among others — is following its blueprint in Spokane and Coeur d’Alene. On its website, it announces protests of Gonzaga University, Whitworth University, Rogers High School, Eastern Washington University, the Synagogue Chavurat HaMashiach, and, get this, Moody Bible Institute. On Oct. 22, it’ll hit up Coeur d’Alene and Lake City High Schools before targeting the Laramie Project production at North Idaho College. The rationale varies. High school students are “vain, selfish, sinful, violent, lusty, God-hating, brats who turn the grace of our God into lasciviousness.” Whitworth University students — on a campus that prohibits alcohol — “spend more time pursuing their drunken sins than their academic studies.” Moody Bible Institute is full of collection plate-obsessed “false prophets” Almost immediately at the announcement, dozens of Facebook groups popped up, as Spokane’s citizens discussed exactly how to respond to the Westboro protesters. Army veteran Mike Ehredt has been chugging across America at a pace of roughly 11 minutes per mile since May 1, when he started at the Pacific Ocean near Astoria, Ore. How far will that get you? In a Facebook post last Thursday, Ehredt writes, “Left New York behind today (same) as I came in 13 days ago ... in the rain. Now into Vemont ... 4056 miles are complete. 363 miles to go!!! Can almost smell the ocean! !” Check out the Locate Mike link at the website projectamericarun.com. Click the right-side arrow a couple of times and the Atlantic comes into view. Ehredt is making the run to honor every single American soldier who died in Iraq — a number that currently stands at 4,424. Every mile along his route, Ehredt has stopped to place a small American flag in the ground. Attached is a yellow ribbon with the name, age, rank and hometown of one of the fatalities. 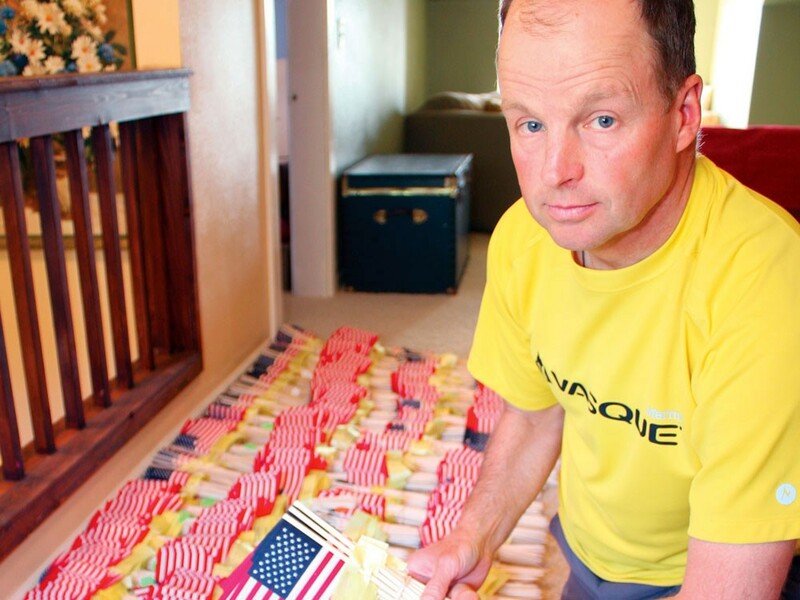 Ehredt has organized the flags in reverse chronological order, so that by the time he reaches his last mile at the shores of the Atlantic Ocean near Rockland, Maine, the one flag he has left will be for the first soldier to die in Iraq: Marine Maj. Thomas Jay Aubin. One lesson coming out of the August primary is this: Young people still couldn’t give a damn about what happens in government. Even after Obama, the Tea Party and all the other random crap that’s made politics — if not fun again, at least — entertaining. This simple fact was proven last week by Secretary of State Sam Reed, whose office wrote up a blog post with a handy spreadsheet breaking down the vote by county, gender and age. Way to go, youth of America. You — and by you, I mean me and a bunch of us here at Inlander HQ — let folks over the age of 35 cast more than 90 percent of the votes. Theatre, discussing “what it takes for Spokane to be a community of courage.” Other big names on the panel are Spokane Police Chief Anne Kirkpatrick, attorney Breean Beggs and Betsy Cowles of KHQ-TV. They aren’t cigarettes, not really. There’s no tobacco streaming out from e-cigarettes, just water vapor and nicotine. But the Spokane Regional Health District has passed a resolution encouraging Spokane-area lawmakers to ban the sale of e-cigarettes to minors. “We are in an awkward position. I want people to quit smoking, but I don’t know enough about this product,” says Christopher Zilar, program manager for tobacco prevention at the Spokane Regional Health District. “Even if someone were able to quit with the product, would they then become addicted to this product, and would there be some long-term health effects?” E-cigarettes are relatively untested. The FDA has not approved them, Zilar says, despite the claims of some manufacturers. There’s no proof of how much nicotine is being delivered. There haven’t been studies yet saying they’re effective at helping people quit smoking.